Raja is a waste dealer in Seemapuri in Delhi, who employs around 15 people to segregate mixed waste into paper, plastic and bottles. His monthly income of around Rs 30,000 is just enough to survive, but his business is always at stake. “There are many dealers without a license in the area. There is frequent harassment from the police or governmental officials who ask for a bribe,” complains 48-year-old Raja. 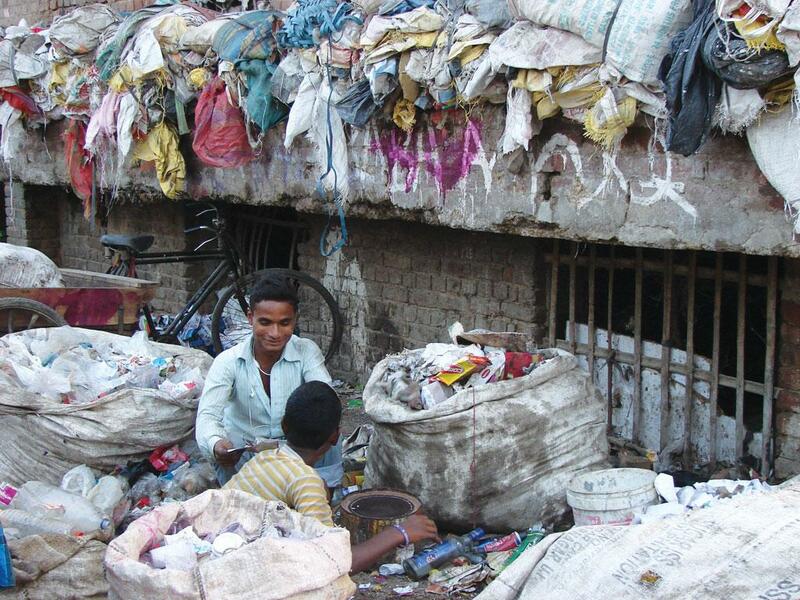 For many unrecognised workers like Raja, who constitute a large part of the waste management sector in the country, the long wait to get formally recognised has ended disappointingly. The recent notification of rules for plastic waste mangement by the Union Ministry of Environment and Forest and Climate Change has once again failed to include the informal sector. The new rules which were first notified in 2011 are meant to improve the implementation of the previous rules, and also to make the waste management system sustainable. “The informal sector is the backbone of waste management, especially plastic and solid waste, and yet it has been completely neglected in the new rules,” says Shashi Bhushan Pandit, secretary, All India Kabadi Mazdoor Mahasangh (See ‘How the new rules exclude the informal sector’). The Plastic Waste Management Rules 2016 mention including waste pickers in the waste management system, but do not mention how that would happen. The rules have introduced the concept of Extended Producer Responsibility (EPR) for the first time, which means that producers, importers and brand owners will be responsible for plastic waste management by opening collection centres individually or collectively. Though a much needed rule, Pandit says that the introduction of EPR will only secure the formal sector and not the informal sector, which handles 20 per cent recyclable wastes—from its collection to treatment. The rules assume a huge significance if one looks at the growth of plastic waste in the country (See ‘Plastic Platoon’). According to a Central Pollution Control Board (CPCB) report published in 2009, the per capita plastic consumption in India was 6–7 kg per annum. The demand for plastic raw material doubled from 3.3 to 6.8 million metric tonnes during 2010-2011. In Delhi alone, 20-30 per cent of recyclable waste consisted of plastic till four years ago, but today, almost 60-75 per cent of recyclable waste consists of plastic, according to CPCB. Experts doubt whether EPR can work without recognising the informal workers. “The informal sector in Delhi employs about 0.2-0.35 million people who transport almost 1,088 tonnes per day (TPD) of recyclable waste,” says Pandit. If Pandit is to be believed, urban local bodies save Rs 80 lakh a year in Delhi because of their services. Shyamala Mani, professor, National Institute of Urban Affairs, Delhi says that “without incorporating the informal sector, EPR can never be successful”. Chandra Bhushan, deputy director general, Centre for Science and Environment, suggests that the state pollution control boards, or the approving authority must ensure the integration of the informal sector in the waste management plan made by the producer, and without such integration, the plan must not be approved. Municipal corporations, he adds, sho-uld enumerate waste pickers and other informal waste workers with the help of civil society organisations. Online registrations and a frequently updated list of vendors on a web portal accessible to the public can ensure transparency. They should also help informal recyclers organise themselves. This will help in implementing the rules better, especially in areas where the informal sector is still largely unorganised. The new rules have introduced some necessary provisions like increasing the thickness of carry bags and plastic sheets from 40 to 50 microns. The generator will have to segregate the waste, and penalties as per the by-laws of the municipal body will have to be paid in case segregation is not done. However, the rules fail to address the management of short-lived plastic products such as disposable plates, glasses, and cutlery which are used extensively. Another contentious provision is the fee of Rs 4,000 per month, which street vendors and shops will have to pay to provide plastic carry bags. Bhushan says that rule lacks clarity on how the municipality will channelise this money and are uncertain on the purpose of its use in plastic waste management. Since the amount can be rather expensive for the vendors, a differential pricing mechanism could have been proposed. “Shops should be encouraged to do away with the plastic bags by providing alternatives such as jute or cloth bags,” he adds. To protect the livelihoods of the workers, he suggests, more should be done. The framing of by-laws under EPR should include an action plan for waste management, and emphasis should be placed on recycling rather than incineration or its usage in road construction, Bhushan adds. Imran Khan of Chintan, a Delhi-based non-profit which works with waste pickers and recyclers, says waste pickers work for about six days per week and around 9-12 hours per day without protective gear. This puts them at a risk of frequent injuries like cuts and bruises. The disposal of plastic also carries severe health risks as it contains heavy metals like lead, copper, cobalt, selenium, cadmium, and chromium, which are highly toxic. Though the new rules look at the bigger picture, plastic waste management is a local problem. The government can set up small enterprises to help the informal sector organise, as proposed in the EPR. Providing health and security benefits must be priority to safeguard their livelihoods. This magazine is eye-opener to the people like me. I feel like doing something in this direction.